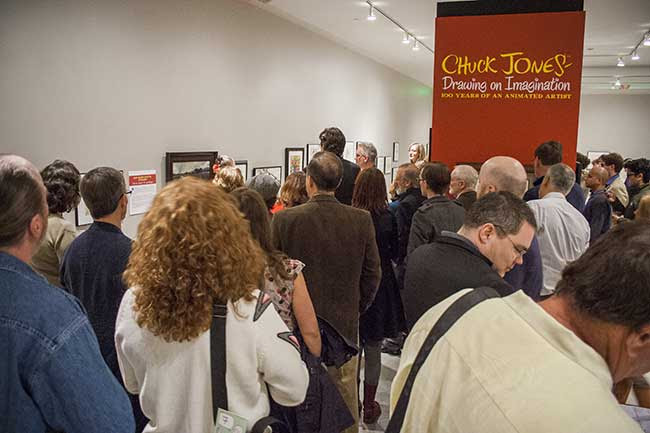 The Bowers Museum in Santa Ana, California announced today that the exhibit, Chuck Jones: Drawn from the Far Side, will open on Saturday, April 26 and close August 3, 2014. Celebrated as one of the greatest directors from the “golden age” of animation, Chuck Jones worked in the field some seventy years until his death at eighty‐nine in 2002. His passion for drawing was both work and full time hobby. He drew for a living, and he drew for pleasure and challenge. This exhibit contains original drawings, most never publicly displayed, including a section of 50 so‐called “Doodles,” perhaps best described as coming from one artist’s very far side. The majority of drawings are from the private collection of Jones’ widow, Marian. 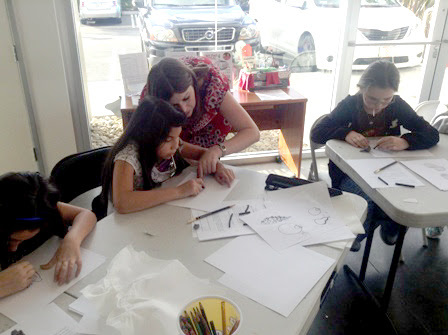 In collaboration with the non-profit Chuck Jones Center for Creativity. For more information, please visit Bowers.org. This entry was posted in Chuck Jones Center for Creativity, The Art of Chuck Jones and tagged Bowers Museum, Chuck Jones, creativity, doodles, exhibition on January 31, 2014 by Robert Patrick. It’s no joke that the Center put out a request recently for new volunteers to assist the organization in its growth goals for 2014 and beyond. This past Tuesday evening, sixteen people answered the call for six defined areas: office administration, marketing, computer support, event support, program artist, and community ambassador. A heartfelt “Thank You!” to all who made the effort and joined us for this important meeting. You inspire us! From left: Alan and Seansay Clayton with Council president Wayne Todd. Anne and Joel Tanner (principal and co-founder of GigaSavvy) joined the evening’s program and offered their social media marketing skills. Tracy Tanner (left), former Council president and now Board member for the public charity, Chuck Jones Center for Creativity, with Lisa Ciminella. Artist Doug Lothers (left), who volunteers his time and talents at a co-sponsored event at the Center for Living Peace in Irvine, sits with Council member and collector, Richard Alcazar. Linda Jones Clough, daughter of Chuck Jones, makes a brief introduction to the evening’s presentation. Craig Kausen, Chuck’s grandson and Chairman of the Board of Directors for the Chuck Jones Center for Creativity presented the vision and mission of the Center to the prospective volunteers. Board members Dave Lowenstein (left) and Steve Smith both bring their considerable business experience to the benefit of the Center and its goals. Craig talked about “Yes” sessions and how easily yes can be destroyed by no, even a no delivered by ourselves to one of our own yeses. Linda Krall, left, with Isaiah Alfaro, artist. Linda is the Council’s veep (not in the Julia Louis-Dreyfus-way) and gave a moving testimony about the power of creativity and how the Center helps inspire the innate creative genius in all people, but especially children. Susan Clemens, left, prospective volunteer with Debra Franzi, a long-time supporter of the programs of the Center. Sean Rohani, prospective volunteer, won one of two raffles this evening, a wool scarf knitted by Linda Jones Clough! Darcia Dexter, also a prospective volunteer, won a limited edition hand-painted etching in the final raffle draw of the evening. Craig Kausen, left, with Martha Flor, collector and supporter of the Center alongside Robert Patrick, a council volunteer. From left, council members Rina Jacobson, Juls Aspinall, and Pasquale Ferazzoli. This entry was posted in Chuck Jones Center for Creativity, Council for Creativity, Events: Past, Present & Future, Inspiration and tagged Chuck Jones, creativity, volunteerism on January 23, 2014 by Robert Patrick.